A Father’s Day Tribute to My Pops! Happy Fathers’ Day Pops! …..We Did It!!! DeSean Jackson F.A.S.T. Camp – June 5th – Washington, DC – Was Awesome! Ahmad Given – VH I Reality Star Dies at 35 from Colon Cancer. On October 28-29, Leila Steinberg, CEO and Founder, of Alternative Intervention Models, a Los Angeles based public charity that has a unique business model that incorporates arts and athletic programs in its curriculum for at-risk youth, partnered with DeSean Jackson, of the Philadelphia Eagles, to launch Jackson’s first inaugural, Make Your Dream Youth Summit, in Philadelphia, PA, at the Boys’ Latin Charter School. Leila Steinberg is an artist and community organizer who began working with youth twenty (20) years ago in the San Francisco Bay area. As the daughter of a criminal defense attorney of Polish-Jewish descent and mother who was an activist of Mexican-Turkish descent, she grew up surrounded by the workings of the justice system and took a front row seat to the personal tragedies and socio-economic pressures that turn so many at-risk youth in hardened felons. Steinberg is committed to helping people who fall through the cracks of society. In 1985, Leila Steinberg developed a series of specialized programs for youth within the juvenile justice system and those residing in residential treatment facilities. As hip-hop music became the expression of today’s youth, Steinberg began training artists to develop voices powerful enough to reach a generation. While conducting poetry workshops in Northern California, Steinberg met Tupuc Shakur; and, he become a regular participant in her class. Steinberg opened her home to Shakur where he read and wrote under her encouragement. Leila Steinberg is credited with being Shakur’s mentor and first manager. She is frequently asked to be a consultant for any documentaries and articles about the superstar rapper, Tupac Shakur. Mistress of Ceremonies for the two-day summit was Ms. Kala, Praise 103.9 Radio Personality & Actress. I was blessed to be the MC for The Make Your Dream Summit given by The DeSean Jackson Foundation and touch the lives of hundreds of young men. These young men were excited to talk and meet DeSean Jackson, his Mother, Mrs. Gayle Jackson, and Leila Steinberg to share their dreams about life as they learned how DeSean accomplished his dreams with the help of his father, Bill Jackson and team of brothers. It was truly a blessing for these young men at Philadelphia Charter School Boy’s Latin and I am thankful to have been apart of it. DeSean Jackson attended a screening of DeSean Jackson: The Making of a Father’s Dream and spoke with students directly following the film. DeSean Jackson, who has built a career on creating highlights, has lived much of his life in front of a camera. The by-product is a new documentary, DeSean Jackson: The Making of a Father’s Dream, compiled from thousands of hours of footage taken by his brother, Byron Jackson, since Jackson was a child. It is a story of his rise to fame from Pop Warner to Pro Bowl and tells the rocky journey of a family to stay together through it all, despite their differences, and in the face of mounting pressure from outside influences. It is a family story, wrapped in the fanfare of an NFL dream. The sentiment “it takes a Village to catch a break” is woven throughout-a sentiment that rings true with the Boys’ Latin community. 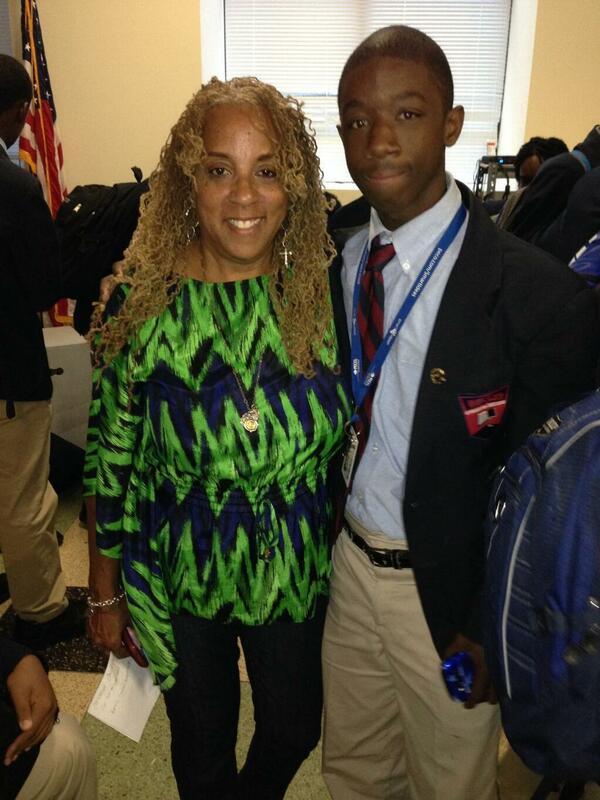 The two-day event reached over 600 predominantly Black young men from diverse backgrounds; and, was deemed a success in challenging those in attendance to maximize their potential to be successful, contributing members of society; seek positive, male role models and be positive male role models; and, to embrace diversity, sensitivity and tolerance. Dr. David Hardy, CEO, Boys Latin Charter School, chaired the two-day event. Javon Rice, star NFL running back, delivered a powerful message. We believe that through courage, curiosity, compassion, integrity, and perseverance, our students will embrace our mantra that Every Man is the Architect of His Own Fortune. For more information on the Boys’ Latin Charter School, please visit: http://www.boyslatin.org.